Horses for courses - choice of a folding bike depends on how you want to use it. For some people, such as train commuters, small folded size and light weight is of paramount importance, while for others the abilility to ride long distances may be more important, and for others the price may be a major consideration. The design of folding bikes, and indeed just about all products, involves compromises, and no one machine is going to be 'best' in all respects for all owners. The members of the team that runs The Folding Society are enthusiasts who are interested in folders, enjoy riding them and using them in a variety of ways. While none of us are particularly well-off financially, because cycling is one of our major interests, we are will to spend more on our bikes than some people may want to. At the low-price end of the folder market, nearly all the machines are originally made in the Far East, and the same bike is often sold by different outlets using different model names. There are so many of these machines, and the specifications and model names change so often that trying to publish a comprehensive product list, and test such machines, is really not a practical proposition. In addition, most of the bikes we test have to be bought by us, and so we naturally tend to concentrate on those machines which, as enthusiasts, we find most interesting, and these are not usually the cheapest ones. We are very pleased to have been given the opportunity to test one of the lower priced folders on the market, and we'd like to thank A S Bikes in Coventry for lending us a bike for this purpose. Given that we generally ride much more expensive folders, we have made every effort to be fair in our comments on this bike - it is unreasonable to expect some of the attributes that might be found on a much more expensive machine. At the time of writing, the model which we tested, the Explorer, with rear suspension, is priced at £150 including VAT, while the more expensive Explorer Plus, which also has front suspension, is priced at £170. Apart from the question of the price of the Explorer, the other essential thing to note is the type of user, and use, for which it is intended. A S Bikes have a number of models available, two with 16 inch wheels (the 'Compact') and two with 20 inch wheels (the 'Explorer'). In each of the two ranges there are two models, one with rear suspension and one with both front and rear suspension (the fully suspended models add the suffix 'Plus' to the name to distinguish them). Although the 16 inch wheeled models will be more compact than the Explorer we have tested, I think it is fair to say that the main market at which all these bikes are aimed is what we might term the 'casual leisure maket' - typically people who might want to take a bike on a narrow boat on a canal holiday, or in a caravan or motorhome, in both cases riding quite modest distances (15Km or less) and where speed of folding and ultimate small folded size is not critical, but where a high price is not acceptable. Our comments on the bike reflect its suitability for that market, though we will make some comments on how it compares with other, more expensive folders. The main frame of the Explorer is aluminium alloy, but the front forks are steel, as are many of the components - not surprising for a modestly priced machine. Incidentally, personally I prefer the use of steel for the front forks if they are not suspended, as aluminium forks are inclined to give a rather harsh ride. 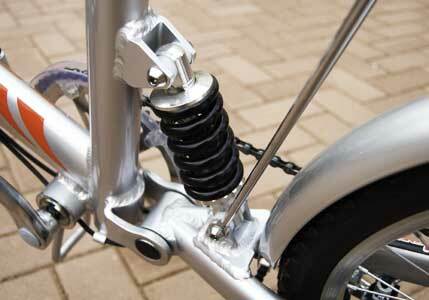 The rear suspension consists of a simple pivot behind the bottom bracket and a spring/damper system to the seat tube. The pre-loading of the spring can be adjusted to suit the weight of the rider - it is somewhat softer than found on many machines, which may be appropriate for the intended market, but might be a problem for an exceptionally heavy rider. The frame has an unusually low step-over height, which will make mounting and dismounting very easy, even for the less agile rider. The loop from the main frame member to the seat tube probably adds a little stiffness to the frame, but is also convenient for lifting or carrying the bike when it is unfolded. 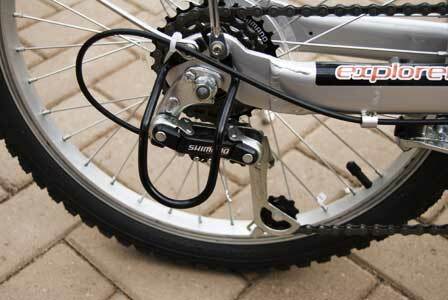 A substantial clamp locks the hinged main frame together when the bike is unfolded, and has a simple but effective and secure dual locking system - the quick-release clamp is released and then the latch is lifted to release a locking pin. 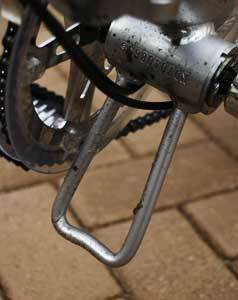 The steerer tube is aluminium, and is hinged to allow it to be lowered when folded. It is secured by a simple locking bracket held in place by a thumbscrew. 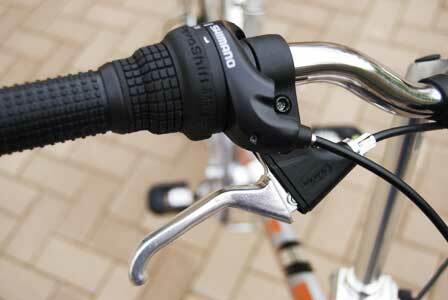 The handlebars themselves are steel, and have a rise and a slight curve towards the rider. The handlebar height can be adjusted by a small amount to suit the rider height and riding style, although even the lowest position is quite high - probably a good choice for the intended market though. Under the bottom bracket is a loop which would serve to protect the chainring from damage if the bike were to drop on an obstacle - on a mountain bike this might be termed protection for 'stump jumping', but it seems wildly improbable that the Explorer would be ridden in this way; instead, on the Explorer this serves to support the bike and protect the chainring when the bike is folded. There is also a protective steel loop mounted around the rear derailleur mechanism to reduce the liklihood of damage - while this adds a bit of weight, it may be a useful feature on a bike which may not be as carefully treated as a more expensive machine. On the subject of weight, the Explorer is quite heavy (listed as 14.75Kg), and the Plus version with front suspension is 1Kg heavier still (the 16 inch wheeled Compact models are listed at about 1Kg less). Although this may not be very notieceable when riding, it certainly makes its presence felt when lifting the bike or carrying it when folded. On a bike of this kind, where lightweight components would increase the price, this is only to be expected, and is probably not an issue for the casual leisure market, but it would be a distinct drawback for anyone thinking of using such a machine for regular train-assisted commuting. The main components fitted to the bike seem of reasonable quality, though obviously chosen with cost in mind. 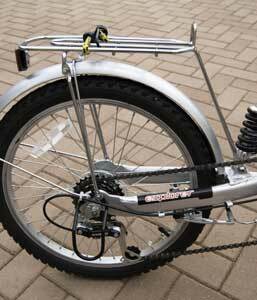 The frame itself seems well-made, and is nicely finished - the test bike was silver. Apart from the small adjustment of handlebar height mentioned previously, there is plenty of adjustment available for saddle height, though as always the very tallest and shortest riders would need to check its suitability. For test purposes a choice of saddles was provided (I imagine a buyer could select which one they wanted at the time of purchase). Personally I generally prefer a fairly narrow, hard saddle, so I selected the narrower of the two - the wider one might suit female riders better though. Both saddles were fairly soft, which always makes a saddle feel more comfortable to start with, but actually becomes less comfortable on longer rides. For the distances I rode, the standard saddle was quite adequate. I found the frame quite stretched (ie distance fore and aft between the handlebars and saddle). Adjustment of the saddle and the handlebar position is possible, but a shorter rider (I am myself only 1.7m, 5ft 7in) might find this a problem, though proboably not a serious one for relatively short riding distances. 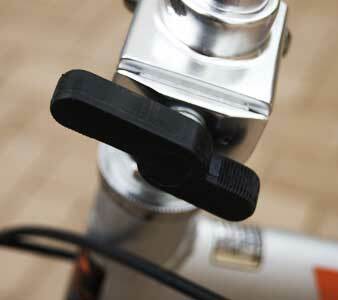 Simple but effective folding pedals are fitted on both sides. >The Explorer is fitted with a 6-speed indexed derailleur system, with a twist grip on the handlebars to control it. The system carries 'Shimano' name badges, though it's not a model normally listed for retail in the UK. While the operation is not as smooth as with more expensive systems, it operated well during the tests, and was actually more positive than some more expensive models with more gears and rather convoluted cable runs (the cable run can lead to friction which makes gear changing less positive on some folders). The 6 gears seem quite well chosen for the intended use of the bike, and bearing in mind the cost constraints - a 48 tooth chainring at the front and a 14-28 cassette at the back give gears of 33 inches to 66 inches (approximately) with the standard, fairly chunky tyres (see further comments later in this report). The crankset is steel, and the chainring is an integral part, so could not be replaced to raise or lower the overall gearing without replacing the whole crankset - probably not a factor for the intended market, and certainly a means of reducing the cost. A single chainring derailleur system, lacking the front changer, can sometimes be prone to the chain coming adrift during gear changes. I have been plagued by this problem on some very expensive bikes. However, on the Explorer this never happened - the limited number of gears probably helps, but also the chainring has plastic discs mounted on both sides. 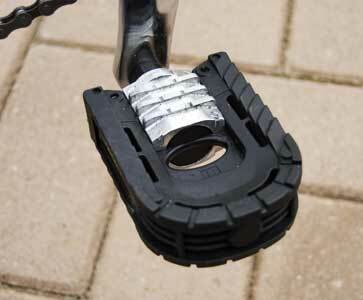 The outer one serves to avoid oil getting on the rider's leg, but it and its inside equivalent also help to avoid the chain becoming dislodged due to chain whip during gear changes. Adjustment of the gear cable length is by the usual type of screw system on the rear mechanism; there is no provision for adjustment on the twist grip itself - an understandable economy for a bike at this price. >The V-brakes do not have any name on them, nor do the levers. Some adjustment was required on the test bike, as they needed centring, and also were set a little on the tight side . The instrucion sheet commendably mentions the importance of centring, and how to do it. 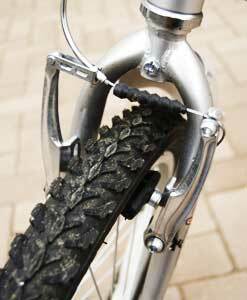 Once adjusted the brakes worked extremely well - powerful and reasonably progressive, and better than those on some much more expensive folders. The levers also deserve praise - very positive, with no flexing and very little slack in the pivots. They are also adjustable for reach, though the angle of mounting does make for a rather long reach even at the minimum, which riders with particularly small hands might find slightly awkward. 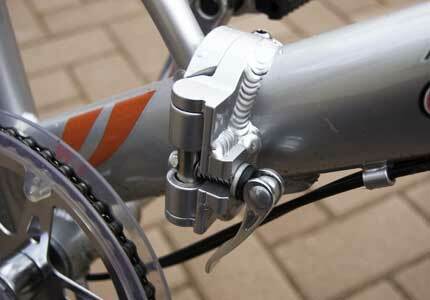 Brake cable adjusters are fitted on both levers. The aluminium-rimmed wheels are fitted with 36 spokes each - rather excessive perhaps, but probably sensible to err in this direction for a bike of this kind. The tyres are 47-406 size (1.75 inches wide), recommended pressure 43psi, with quite a knobbly tread pattern. On the road they did not roll too badly, though certainly less free-running than the type of tyre I would normally use. On some light off-road riding (towpaths and bridleways) they performed well, and given that leisure users may well ride the bike on such surfaces, this is probably a sensible choce, though anyone intending to ride primarily on tarmac roads would find a change to a smoother, higher quality tyre would be advantageous (reducing rolling resistance and weight). As might be expected in a bike of this price, neither front nor rear wheel had a quick release, so for tyre changes you should make sure that your toolkit includes a suitable spanner (most multi-tools will not have such an item). Apart from the items mentioned earlier, the Explorer comes with a rear (steel) mudguard and a rather primitive plastic front mudguard - the former provides good coverage of the tyres, but the latter, as well as looking rather crude, provides limted protection. The full complement of reflectors and bell called for are fitted. The is also a propstand - useful to the intended market, though it does add to the weight (it is steel). There is also a reasonable rear carrier fitted - not up to touring cycle standards, but more than adequate for carrying wet weater gear, refreshments, or even a not-too-heavy shopping load. Not surprisingly in a bike of this kind there are no bottle mounting bosses - entirely excusable on this bike, but sadly also lacking in some far more expensive folders aimed at users who do expect such things. Generally standard cycle accessories should fit without difficulty - during the test I used a Carradice SQR bag and mounting for luggage, and I also fitted standard Cateye lights front and rear. A S Bikes list carrying bags, panniers, lights etc as accessories they can supply. No tools or pump are supplied with the bike. The test bike was supplied with an 8 page 'Manual Book', and with a single A4 sheet of more anglicised instructions - remarkably comprehensive given its brevity! The Explorer is fairly conventional in that it has a hinge in the main frame, secured by a two-stage locking clamp, and the handlebar assembly folds down - secured by a thumbscrew. The folding and unfolding process is quite straightforward and reasonably quick (though the thumbscrew for lowering the handlebar assembly is a little slower than a quick-release system would be). The seatpost is lowered or raised after realeasing the usual type of quick release clamp, and both pedals can also be folded down. The time taken to do this is about average for any folder of this type. Once folded a strap is really needed to hold it in the folded state (an elastic bungee is supplied with the bike for this purpose), as is the case with many other folders (the fact that the best compact folders are designed so that they lock into the folded position is one of their benefits, at a price). The seat post does not have any markings, so to restore it to the required height after folding is a case of trial and error, or putting an indelible mark on the post (do not file a groove in it, as this will weaken the seat post with possibly disasterous results!). The folded bike is quite bulky compared with compact folders, though no worse than most other folders in the same market sector. It is also decidedly heavy - unfortunately saving a few pounds in weight costs a lot of pounds sterling. This is not a folder I would want to use for regular train-assisted commuting as it would be heavy and difficult to carry any distance when folded, and would be a bit bulky when folded. In this respect though the Explorer is typical of similar bikes in the same price range. The 16 inch wheeled models would probably be better in this respect, but for anyone looking for a folder for regular train-assisted commuting I would suggest that they would be happier with a higher specification compact folder - at, or course, a significantly hgiher price. The best known such machine is the Brompton - but at 3 times or more the price of the Explorer! The very full specification of the Explorer (propstand, mudguards, derailleur guard etc) no doubt contribute to the weight, but even so this is one area in which the Explorer is rather disappointing. This is not a bike intended for long distance rides, and so our road tests have not been as extensive as for most other folders. We have concentrated on using the bike under the sort of conditions which we think would be typical for the intended market. This involved a few local rides of under 10Km, plus one longer, fairly leisurely, ride of about 35Km. This last ride turned out to be hillier than expected, the the lack of gears did force me to push up one hill! Otherwise, though, the gears seemed well chosen for the intended use - on paper they look on the low side, but given the weight, tyres, and possible off-road use the chosen bottom gear is sensible. On the road I would have appreciated a rather higher top gear - a 14 tooth smallest sprocket is quite large, and had it been possible to use a 12-28 or 13-28 combination in what is only a 6-speed block, the range would have been appreciable improved. The brakes were very effective on the descents (though there seemed fewer of these than ascents), indeed, better than a jumber of more expensive folders. Around town, in a mildly hilly area, the bike performed adequately. The frame felt quite rigid, and the low step-over height made it particularly easy to manage in town conditions. There is some flex in the quite long hanlebar/steerer tube, though only very energetic riders (not the intended market) are likely to notice this. I found it difficult to achieve a riding position that suited me: the angle and height of the handlebars and the slightly stretched riding position were not ideal for me, but I think that the majority of the probable buyers of this type of machine would actually prefer the higher handlebars and their angle, though not necessarily the long reach. On the road the relatively soft rear suspension was comfortable, and was also welcome on some light off-road riding (towpath and bridleway). The relatively wide, knobbly tyres were a boon on these off road conditions, but were something of a disadvantage in terms of rolling resistance on tarmac. Although the test model was the one without front suspension, I found it quite comfortable - the wide, low-pressure tyres helped in this respect no doubt. Folding and unfolding was not more of a problem than with most other folders of this type, but the folded bike is quite bulky and decidedly heavy. I avoided folding the bike when possible, keeping it in the unfolded form on local trains. Actually, apart from Brompton owners, most owners of other folders don't choose to fold their machines unless they have to - despite extolling the virtues of how easily and quickly their model can be folded! Compared with the much more expensive, lighter folders which I normally ride, the Explorer did feel rather cumbersome and sluggish on the road, but for the sort of distances and type of riding for which it is intended, this should not be too much of an issue, and is typical of machines of its type. While I normally think that suspension of a small-wheeled bike is very desirable, I believe that for bikes in this market segment there is a strong argument not to bother. Personally I would recommend anyone buying the machine not to go for the fully suspended version - this way you not only save money, but also you should reduce the weight a bit, and I think this will be very welcome. In terms of comfort, the suspension does help, but for the relatively short rides for which this type of machine will be used, and given the fairly wide, lowish pressure tyres, I would regard the weight saving of omitting the suspension to be worth a slight reduction in ride comfort - indeed, I would welcome a lighter version still which omitted the rear suspension. This is the cheapest folder that I have tested in recent times (ie the last 20 years) - probably the nearest in price being the Downtube which we had just over a year ago. Compared with the folders which I normally use, the Explorer certainly felt rather limited and limiting, but, Downtube apart, those other folders are 3 to more than 10 times the price of the Explorer. While the Downtube also outperformed the Explorer, even it is 50% or more in price than the Explorer, and it has no mudguards, and no provision for fitting any, and also lacked some of the fittings such as the carrier which are standard on the Explorer. For anyone who does want to ride further (say more than 15Km) or needs a very compact folder for regular use on trains etc, the extra money may be worth it, but for the purely casual leisure user who needs the convenience of a folding bike, the Explorer was a sound performer - for its price, it is quite well specified, with good brakes and well-chosen gears. Choice of a folder is always a case of horses for courses and riders. The Explorer is a very modestly priced folder which is clearly aimed at the casual leisure user who will not be ridng long distances. The fairly large folded size (compared with expensive compact folders) and weight make it less than ideal for regular train-assisted commuting, but again this is not really the primary market for such a machine. Although the very complete equipment specification must contribute at least in part, the weight was the most disappointing feature of the Explorer. 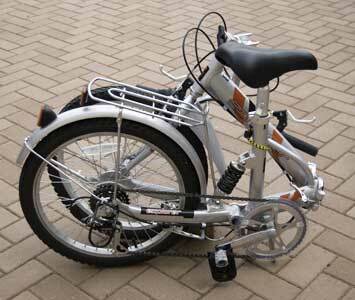 As a more serious rider, and folder enthusiast, personally I don't mind spending more on a higher performance folding bike, but for those who are looking for a cheap casual leisure folder, perhaps for use when caravanning, motorhoming or using a narrow boat, the Explorer is a sound performaer, and should be perfectly adequate. We would like to thank A S Bikes for the loan of the test bike. A S Toys Ltd, Lakeview Farm, Coppice Close, Leamington Road, Ryton on Dunsmore, Coventry CV8 3FL. We thank the Folding Society for the time taken to test our bike. Over the past years we have liased and learnt from the society as we have developed the bike. This is now the 7th design of the Explorer and we feel it is very good at the selling price for our intended market. 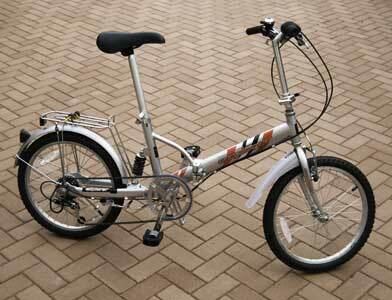 We sell this for light offroad/onroad for the casual leisure rider, normally for canal towpaths, caravanners & motorhomers. The Folding Society have made all just allowances in their report for this. To submit a budget bike to them is rather brave on our part as they are true enthusiasts and this is not their preferred type of bike. They have been very fair in the test and state that as a casual leisure folder, perhaps for use when motorhoming, caravanning or using a narrow boat, the Explorer is a sound performer, and should be perfectly adequate. Answering some of the points from their report. 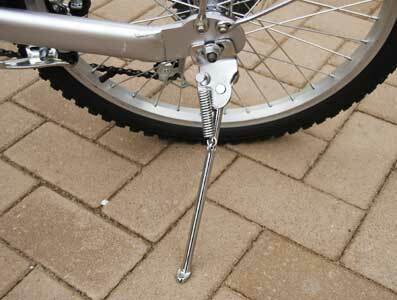 The rear shock is fully adjustable and can be made very stiff if required. We have tested it up to a body weight of 23 stone and it does not bottom. The bike is very strong and will support body weights much higher than most folders. For shorter and taller riders we sell a gel saddle that will adjust forwards and backwards 3” (75mm) This is perfect for increasing or decreasing saddle to handlebar gap. If your knees/legs do not have a full range of action you can choose a position more comfortable to suit you. Weight. We think its very manageable for lifting into the car boot / motorhome etc. Most of the cheaper folders weigh a lot more than ours and some on EBay understate they weights by up to 2 kilos as we have purchased them and weighed them. Our bikes were weighed on Avery public scales and are correct. To put in context the new Raleigh Parkway 20” folder which does not have rear suspension fitted is listed on the websites as 16:8 Kilos over 2 kilos more than ours. The other main difference is you now have an independent report/opinion on the bike (warts and all) which we do not think you are going to find for any other budget folding bicycle. We give a one year quibble free warranty and attend canal boat, caravan and motorhome shows throughout the year (details on our website normally giving you a chance to inspect and ride them before purchasing or we are available for visitors at our Coventry home base Mon-Weds 9am – 4pm. Once again our thanks to the Folding Society for a fair and unbiased report.